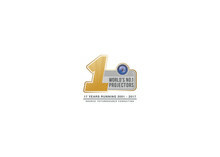 Epson has been named the number one projector brand in Philippines as well as worldwide by Futuresource Consulting , having held the leadership position for 17 consecutive years. The milestone reflects Epson’s continued market leadership and constant innovation in the visual imaging industry. Epson Philippines continues to gain market traction and achieve leadership position in key segments, driven by the company’s focus on the B2B segment and developing its core technologies in four key pillars of innovation – inkjet, visual communications, wearables and robotics – to drive growth for its business customers.